Want to update your own website? A Content Management System (CMS) is a website application which allows you and your team to manage your website content, text and images with ease. You will be able to log in to your website 24 hours a day, 7 days a week and have complete control over your website content. Updating your website blog or news page will give your visitors a reason to come back and visit your website again and again. Updates to your website are made by you and your team. Once logged in to your website you will have access our easy-to-use control panel allowing you to add, remove and edit text, content and images as you please. Pages can be saved as drafts to be completed at a later date, published or privacy controls can be set to protect pages. Images can be uploaded into the media library which is simple as drag and drop, and then positioned on your webpage. 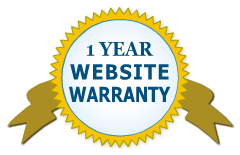 We are here to help you every step of the way with your new CMS Website. 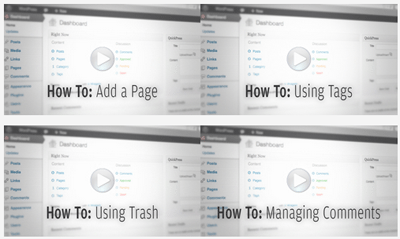 As part of your package we can include “How to” CMS Tutorial videos that will show you how to update your website. You can watch the videos as many times as you like, whenever you like, as long as you have an internet connection. The tutorial videos cover maintaining posts, pages, menus, organising content, responding to comments on your blog, uploading media and embedding music and videos. Our CMS Tutorial Videos are updated on a regular basis with new topics and tips, view a sample video here. 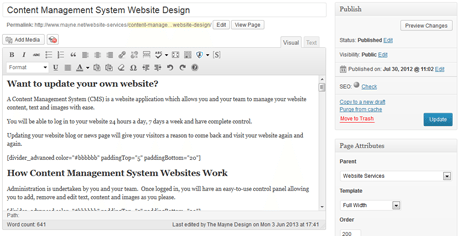 Your new website will be deployed using WordPress CMS. WordPress the market leading CMS and used on over 70 million websites. If your business website needs 4 pages or 400 pages, WordPress will expand as your business grows. From a hundred website visitors per day, to a hundred thousand visitors per day, your CMS website has the scalability to meet your business demand. In the future if you need to add an online forum, reservation system or other function, it can be added to your CMS website without needing to start from scratch. From just £1,499 for a Content Management Website, fully inclusive of the free first year features – a CMS website could be answer to your business needs. We’ll set up the initial website – then you are free to add and edit pages to complete your online content. Let us know your business needs and we’ll provide you with a competitive quote. You will also be provided with the documentation you need so you can update your website like a pro – and if you need help we’re just an email away. To learn more about our Website Services please select a topic from the menu, or if you already have the information you need then please Contact Us with your requirements.